Steven de Selby has a hangover. Bright lights, loud noise, and lots of exercise are the last thing he wants. But that's exactly what he gets when someone starts shooting at him. Steven is no stranger to death-Mr. D's his boss after all-but when a dead girl saves him from sharing her fate, he finds himself on the wrong end of the barrel. His job is to guide the restless dead to the underworld but now his clients are his own colleagues, friends, and family. Mr. D's gone missing and with no one in charge, the dead start to rise, the living are hunted, and the whole city teeters on the brink of a regional apocalypse-unless Steven can shake his hangover, not fall for the dead girl, and find out what happened to his boss- that is, Death himself. Seriously that’s what this book is about. Well Death and the company that runs it. You see death doesn’t just take care of its self, when you die your soul has to go somewhere, and that’s where the company comes into play. They, pomps, act as gateways to the afterlife and it’s them that keeps everything in a natural order of sorts. Of course now that someone is killing all the pomps, it’s certainly making life harder for Steven de Selby, one of the only pomps left in Melbourne. Between trying to find out who’s killing his family, trying to locate his boss, Mr. D, and avoiding dying himself life is just a little bit harder than it used to be. I will say this before I review this book, I’ve always had a fondness for books that personify Death. And Death doesn’t get any more humanistic than this. I felt like the story started off odd and at certain points I got bored with the characters but overall I liked the pace and feeling of the story. De Selby is not the most endearing of characters and Jamieson (the author) could have done a better job creating better support characters. But de Selby and the others not horrible and by the end, the story is interesting enough that I’d be curious to read the sequel Managing Death. 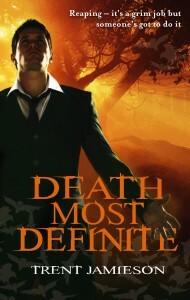 All in all Death Most Definite is not the best book in the world, but nor is it the worst. It’s a comfortable middle ground that offers up enough excitement and entertainment to keep the reader engaged and happy for a rainy day, but certainly not a must read book.